"The Spirit of the American Doughboy"
The "American Doughboy Art Lamp"
1923 (est.) - "GOB" - "The Spirit of the American Sailor"
1926: "The Spirit of the American Navy"
1927: "The Spirit of the Skies"
1935: Viquesney's Version of "Over the Top"
1935 (est. ): "Women of the Confederacy"
1942: "The Yanks Again", "Eagle's Watch", and "Remember Pearl Harbor"
"And So the Scene Closes"
Viquesney on the left, Rebechini on the right. Who's the creator of this work? Interestingly, Viquesney's 1938 "Lincoln as an Indiana Boy" is almost identical to a work by Guido Rebechini, titled "Young Lincoln Learning" which was reported to have been exhibited at the 1933 Chicago World's Fair. If that information is correct, then Viquesney blatantly "borrowed" the design. However, Rebechini's grandson, Glenn, who still runs the family art studio in Elk Grove, Illinois, is unsure if his grandfather's work is really an original design, as it is unsigned, and concedes that it may indeed be a reproduction of Viquesney's statue. He was just always told through family recollections that his grandfather's statue was displayed at the 1933 fair. Also, the University of Illinois at Chicago Library, which has the world's largest collection of 1933 World's Fair memorabilia and documents, has no record of any such Lincoln statue being exhibited there. Thus, until hard proof is obtained to the contrary, Viquesney is considered to be the creator of this piece. Our suspicion is that if Guido Rebechini's "Young Lincoln Learning" was displayed at a fair in Chicago, it was probably the later Chicagoland Fair, which began in 1957 and ran annually for a number of years. It's known that Guido Rebechini had pieces displayed there, notably a giant bust of Thomas Edison. A 2004 cast bronze copy of Rebechini's original ceramic work (above, right) is on display at the Des Plaines (Illinois) Public Library, where it is still listed as having been displayed at the 1933 Chicago World's Fair. To compound matters, this "fact" is also recorded in the Congressional Record, where it is not likely to ever be expunged or corrected. But several factors point to Viquesney as the original sculptor. For one, family lore is often notoriously unreliable and embellished over the generations, and second, Viquesney left a three-year paper trail in the form of correspondence with various Lincoln authorities discussing what the man would have looked like as a youth, what kind of clothes he would have worn, and even what the shape of the hound dog's head would have looked like back in the 1820s. But the final "nail in the coffin" is that Viquesney's version was signed and copyrighted; Rebechini's was not. Since it's against "The Rules" to copyright someone else's work, we are left with the conclusion that Guido Rebechini's "Young Lincoln Learning" is a later replica of E. M. Viquesney's "Lincoln as an Indiana Boy", and that it could never have been displayed at the 1933 Chicago World's Fair five years before Viquesney's version appeared. As mentioned on the main Lincoln page, in 1938 Viquesney tried to sell his statue to the Lincoln Life Insurance Company without success. In 1963, Guido Rebechini's son, Ferdinand, tried to do the same with his father's statue, and again, just as with Viquesney, Lincoln Life politely turned him down, once more citing the company's preference for its own 1929 Lincoln statue by Paul Manship. 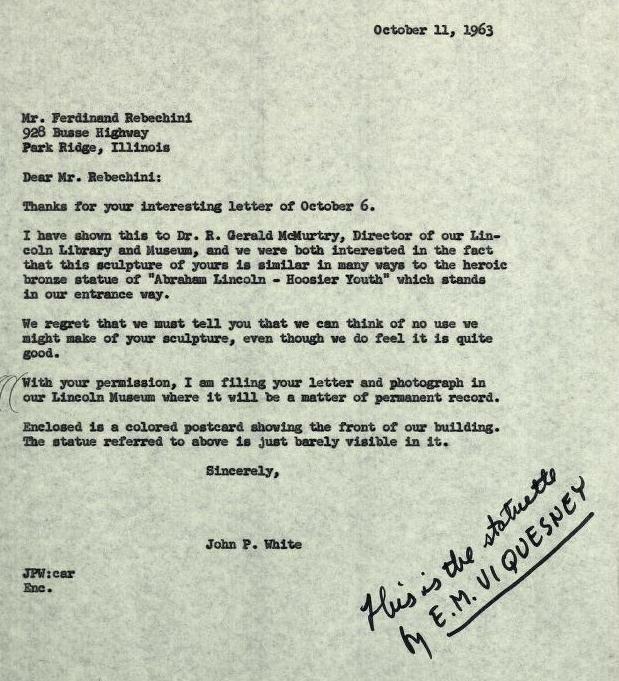 In their reply below, Lincoln Life never let on that they knew Rebechini's statue was Viquesney's work, but on what is probably the internal file copy of the company's return letter, someone had handwritten in the comment, "This is the statuette by E. M. Viquesney".